Wild discus fish are a bit harder and demanding to keep compared to the domestic discus fish. However, the basic requirements for both are all the same. These requirements are like warm, clean, fresh water as well as a varied diet. Wild discus care therefore would be easier for one who has experience in keeping domestic discus fish. Wild Discus fish require more attention and adherence to the basics of general Discus fish care. There are actually three distinct species of wild Discus fish one can choose from when you want to consider keeping them. Each of the species happens to have a unique and different water conditions with some of the conditions being shared among them. Apart from water conditions, there is also the concern of parasites that are common to most of the fish caught in the wild and the others that are particularly of more concern among wild Discus than say, wild caught Cardinal Tetras. A big factor in wild discus care is the preferred water conditions for each of the three wild Discus species. In my opinion, I would recommend S. haraldi as your first wild Discus, which is the blue/brown Discus fish. Compared to the other two species, S. haraldi happens to have highest adaptation ability to the extreme water conditions. S. haraldi in most cases may be easily kept in a fish tank containing just your tap water. The species can easily adapt to and thrive in water with a pH of 7.4 and 400 ppm TDS. Further, when it comes to the chemicals which constitute the total dissolved solids, wild Discus prefer if the water KH is below or equal to 6* and GH should be below 8*dGH. Having a KH of 4 to 6* will help stabilize pH of their aquarium water. The KH should not be 3* or below though as it would make the pH drop quickly under the influence of any build up in organic wastes in the water ( pH crash). Another important thing to consider is your source of wild Discus. 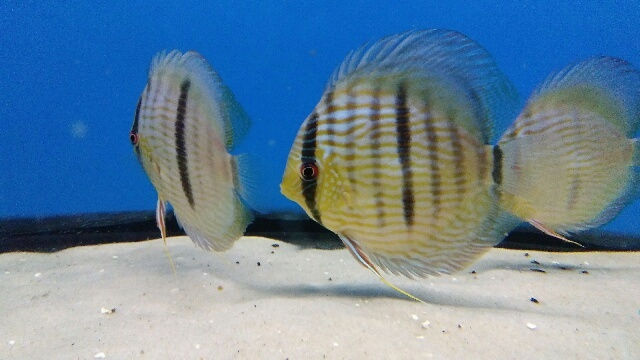 You should choose a supplier that treats his/her newly imported wild Discus fish for the common parasites and does a proper acclimatization of the fish to environment as well as feeding habits. This however has nothing to do with the price and you therefore base the quality of the wild Discus fish you are buying with the price you get them at. The bottom-line is that the source/supplier should be trustworthy. Having discussed S. haraldi as the most adaptable and hardiest wild Discus fish species, there are also the Heckels and Greens. Both of these species are very particular about the chemistry of water compared to any variety of S. haraldi. This makes them less adaptable to new environments and water conditions. More so, you can get affordable S. haraldi in the USA depending on the color form as well as behavior of the buyers. At times when a demand for a particular type is high, the price may rise as well. Finally, after acquiring your preferred type you should pay great attention to acclimatization. This can be done after you have decided on your supplier as well as your budget. You should hve a quarantine and acclimation tank ready for the new wild Discus. You will use the water conditions recommended by your supplier to make things easy. Do so for a period of 30 days but in a gradual manner in order to make your wild Discus acclimatize to the condition of your fish tank water which you will eventually manage without straining. This process is easier as mentioned earlier for S. haraldi compared to Greens or Heckels and hence are recommended for a first timer.